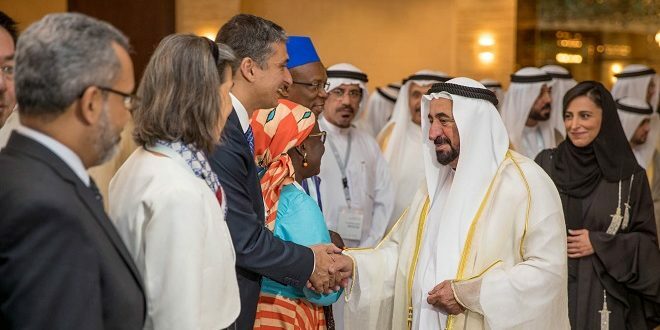 His Highness Sheikh Dr. Sultan bin Muhammad Al Qasimi, Member of the Supreme Council Ruler of Sharjah, yesterday presided over the opening of the Sharjah FDI Forum 2017, which commenced at Al Jawaher Reception and Convention Centre, Sharjah. Under its theme ‘The Fourth Industrial Revolution, the third edition of the annual event organised by Sharjah Investment and Development Authority (Shurooq) and the Sharjah FDI Office (Invest in Sharjah) features a host of economic experts from the public and private sectors, examining the latest advances in technology, robotics and Artificial Intelligence (AI) and discussing how these are impacting on the regional and global investment landscape. 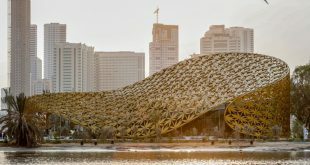 “Sharjah is an emirate that recognises the active role which entrepreneurships play in supporting and contributing to the emirates innovative, educational and sustainable economy. 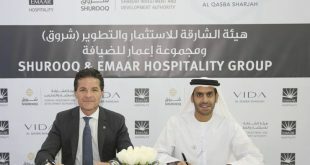 It was on this recognition that Sheraa, Sharjah’s official entrepreneurship centre, launched its Sheraa Accelerator Programme to the international stage by inviting entrepreneurs from within the UAE, and across the globe, with its first phase witnessing ten innovative startups across sectors, such as the Blockchain technology and Virtual Reality,” added Sheikh Bodour Al Qasimi. “The Fourth Industrial Revolution also represents a great opportunity for the education sector, as it requires the workforce to possess different skills. This places Sharjah at the centre of these profound transformations due to the global educational infrastructure it possesses. The emirate is ready to play an important role in the region to build up the potential in the educational system and to cooperate and partner with the business community to benefit from the ongoing transformations in the world. The fact that we were awarded the title World Book Capital 2019 from UNESCO (United Nations Educational, Scientific and Cultural Organisation) is proof in our belief in supporting culture and education and the importance of their role in human and community development,” she added. H.E. Sultan bin Saeed Al Mansouri, UAE Minister of Economy, followed Sheikha Bodour Al Qasimi’s speech with a key note address that highlighted Sharjah’s resilience, its ability to attract foreign direct investment and the emirate’s significant contribution to the UAE’s economy. 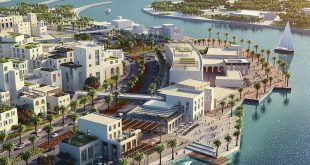 “Sharjah is playing a key role in the sustainable development of the UAE and has attracted major FDI in-flows, with this figure in 2015 standing at 38 per cent of the UAE’s total. Despite a small slowdown in 2016, it was still able to attract a total of 1.7 trillion dollars this year. Our policies are now looking at attracting foreign direct investment in specific areas in order to help create a knowledge-based economy and ensure sustainability. We are stimulating investment in renewable energy, transportation, SMEs, tourism and the aerospace sectors, with technology specific areas including the Internet of Things, Cloud computing, Big Data and 3D printing. These policies have made the UAE the 12th most attractive global destination in 2017, according to UNCTAD (United Nations Conference on Trade and Development),” he said. 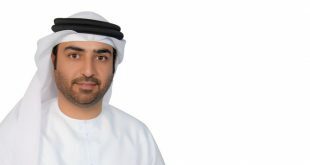 Highlighting the challenges inherent in new technology, Mohammad Burhan, CEO of CNBC Arabia said: “The statistics show that over the next two years, AI will shed about 5 million jobs for humans. Taking into account the rapid development of industries and the sophisticated investments they have already allocated, global companies need to increase their research in this regard. There are no gains without challenges. The opportunities and challenges that the Fourth Industrial Revolution present are the most important considerations that impose themselves on the research table and they occupy the most prominent economic policy theorists in the world today. This is one of our forum’s discussions this year in Sharjah, along with topics related to the sustainable economy in the Middle East and North Africa region, innovation issues and the challenges of developing small and medium enterprises,” he said. Giving the final opening address at the forum was Jonathan Labin, who highlighted that it was 10 years when Steve Jobs launched the first Apple i-Phone. He predicted that in the next decade the world would witness even greater technological changes driven by the three platforms of mobile, AI and Virtual Reality (VR). “There are 2 billion Facebook users globally and 160 million in the MENA region alone. It is estimated that 20-30% of our day is spent looking at screens, with six out of the 10 top downloaded apps being messenger apps. This means that mobile is still the biggest business opportunity for 99% of businesses. Most people think that AI is about robots, but I prefer to see it more like electricity in that it will be everywhere. Most things can be made better with just a little bit of intelligence. VR, for its turn, will change how we all experience the world. Social VR will become the next big thing and has the potential to revolutionise human interactions,” he said. Following the opening speeches, His Highness Sheikh Dr. Sultan bin Muhamed Al Qasimi took to the stage to honour the sponsors of the Sharjah FDI Forum 2017. Among those receiving commemorative plaques were Platinum Sponsors Bank of Sharjah and Alef Group.